HM Journal Issue 03 ACW 11th Indiana "Wallace's Zouaves"
The service record of the 11th Indiana Infantry Regiment "Wallace's Zouaves" covers the American Civil War from August 1861 to July 1865. The regiment participated in these important campaigns and battles in the West: Forts Henry, Heiman, and Donelson Feb 1862; Battle of Shiloh Apr 1862; Siege of Corinth May 1862; on duty at Memphis Jun 1862; transferred and duty at Helena, Arkansas Jul 1862 to Apr 1863; Grant's crossing Bruinsburg/Grand Gulf Apr 1863; Battle of Port Gibson May 1863; Battle of Champion's Hill May 1863; Siege of Vicksburg May - Jul 1863; Siege of Jackson Mississippi Jul 1863; transferred to and duty at New Orleans Aug 1863; Western Louisiana campaign Oct to Nov 1863; duty in New Orleans until May 1864. The regiment was then transferred to the Eastern theater in July 1864 and assigned to Sheridan's Army of the Shenandoah where it participated in the Shenandoah campaign from Aug to Nov 1864. The regiment fought at Opequan (Winchester) 19 Sep 1864; Fisher's Hill 22 Sep 1864; Woodstock 23 Sep 1864; Mount Jackson 24 Sep 1864; and Cedar Creek 19 Oct 1864. It remained on duty in the Shenandoah Valley into January 1865 and then transferred to duty at Fort Marshall in Baltimore, Maryland, until 26 July 1865 when it was mustered out. During all of these battles and campaigns the regiment lost 1 officer and 114 enlisted men killed or died of wounds and 3 officers and 170 enlisted men died of disease for a grand total of 288 war deaths. The 11th Indiana Infantry Regiment originally wore a gray Americanized-Zouave uniform that quickly wore out after one year of service. 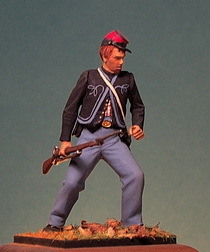 In designing a replacement uniform, Colonel Lewis Wallace considered Union blue, and an even more Americanized version of the Zouave jacket with integral vest. 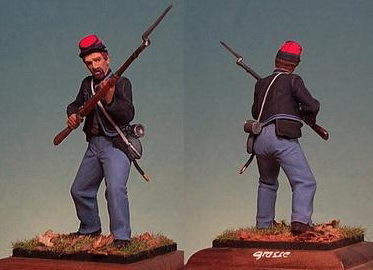 The use of U. S. Army sky blue trousers was adopted but the distinctive red kepi was retained. This uniform was worn throughout the war with some individual modification as time wore on. 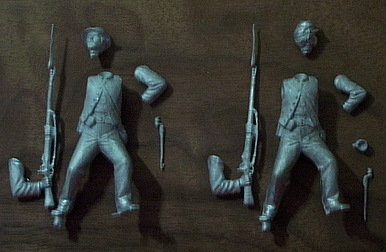 The figure chosen from which the 11th Indiana Zouave is made is Shenandoah's Confederate infantry series, SHC025 thru 27 all of which use a crouched body with short shell jacket in the open position. Figure 1 below shows the unaltered kit on the left and the modified kit on the right. Note that I have added a tin cup and replaced the slouch hat head with a kepi head. The trousers are standard issue sky blue. Note that the modified kit figure on the right does not have jacket taped trim or trefoils. These will be painted on. The bayonet in scabbard will be trimmed since the rifle-musket has a bayonet. Figure 2 shows the polished body with head on and the integral vest added. The only part glued to the body at this time for priming and painting is the kepi head and the integral vest. You can see the right side of the vest. I cut off "buttons" from a piece of plastic sprue and fixed them in place with super glue. All parts have had their casting seam lines carefully removed with an X-Acto tool and then buffed with a Dremel #428 wire brush. All other parts will be primed and painted separately then glued after the body is painted. Of course, there will be a little touch up so it's important that the uniform blue used, whether your own mix (as I do) or from a bottle, be available so you don't end up with different shades of paint where touch up was performed. 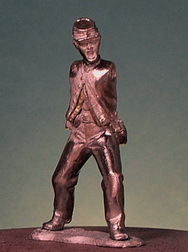 After priming with a metal figure primer, the figure is mounted on a working or finished wood base. The bottom of one foot is drilled out to take a short brass pin for mounting purposes. A working wood base means that the figure will be dismounted from the base after painting and set in a vignette. As usual for me, I paint the face first, apply a thin liner around the bottom of the kepi and the top of the jacket collar, paint the shirt, apply a liner between shirt and jacket, and paint the kepi. The shirt is finished next. Whenever open jackets are used, I will paint the majority of them in the Union Army gray undershirt but a fair percentage of the enlisted men wore a variety of civilian styles sent by relatives from home, purchased from a traveling sutler, or "borrowed" from a local countryside farm. The rest of the uniform is pretty straight forward. Figure 3 shows a slightly different 11th Indiana enlisted man, front and back. Figure 4 shows the opened integral vest, hand-painted trefoils/jacket trim, and red/white plaid shirt to good advantage. Details of the uniform are simple. Only the kepi and jacket are unique. There is no cuff trim and only a double row of light blue trim around the jacket, the inner one ends in the trefoils. The kepi has a dark blue base, red crown, and dark blue piping (shown to best effect in Figure 4, above). The Osprey source listed below shows an 11th Indiana enlisted man wearing leggings which might be okay earlier in the war.